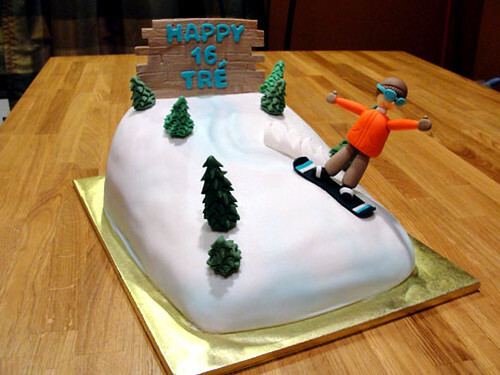 As we neared the end of the winter sports' season, I had a chance to hop back on my board and carve some snow... and a cake for Tré's 16th birthday. Jennifer had requested a retro oven cake for her sister, Jill, last year. 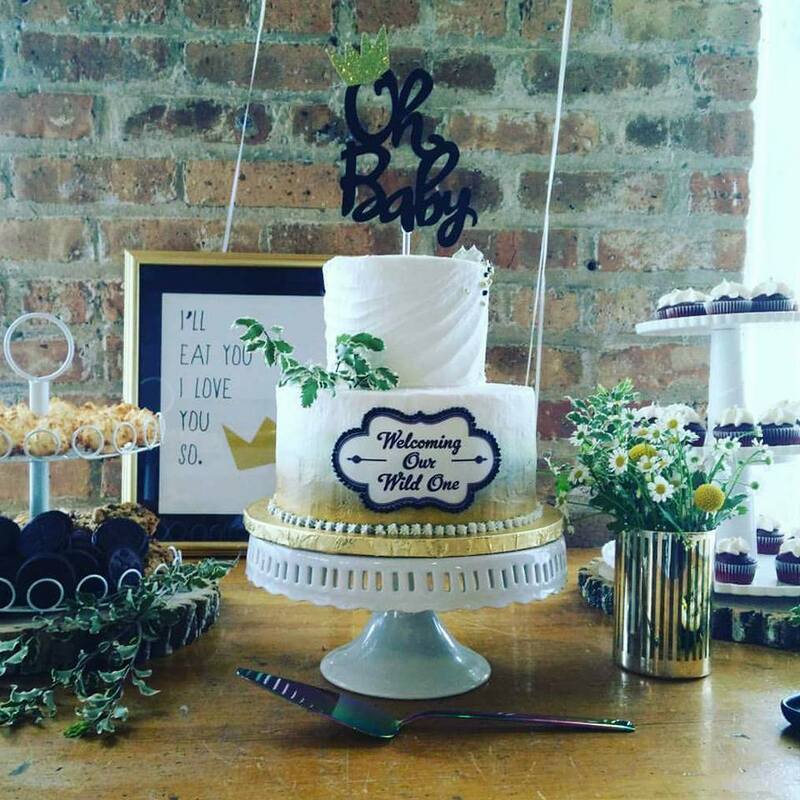 This time, she had requested a cake for her son, Tré. For his 16th birthday, she had outfitted him in new snowboarding gear, and she wanted to carry that through to the cake. I started with the star of the cake and began shaping a miniature Tré. Jennifer gave me a list of of Tré's new gear, and I began modeling him out of 50/50 mixture of gumpaste and fondant. Starting with his torso, a bright orange jacket created to keep him warm. I created indents where I could join his limbs with a small ball tool. Next up was his head where I used the torso as a size reference to keep it proportionate. Who wants a big noggin? A cute little ball was attached for his nose, and with this in place, I can reference the placement of the other facial elements. The hat was created and fitted over his head by shaping a round circle around an end of my small rolling pin. Details of the ribbing was then notched in using the back of an knife. To complete the head, teal colored goggles were created out of gumpaste and attached with a little water. His limbs was the next crucial step because his legs would be the support of the body, and I would hate for him to fall apart. I started with skewers sticks for strength, and shaped his legs individually with khaki colored 50/50 mixture, and made sure his black boots were secure to the sticks. I left a good inch of skewer stick exposed on top in order to insert the legs into the torso. The arms were shaped around tooth picks and then attached to the torso where I had indents earlier. This gives a seamless and cleaner look. No snowboarder is complete without a board, and Tré just picked up a black one with white and teal details. I cut out the shape of board from a flat sheet of black gumpaste, and left it to dry in a former I created out of cardboard to give it's signature bend at the nose and tail. I also made two small holes where his boots would be positioned on the board for the skewer sticks to go through. Stripes of the white and teal were attached with a touch of water. Time for Tré to sit aside while I work on the slope! 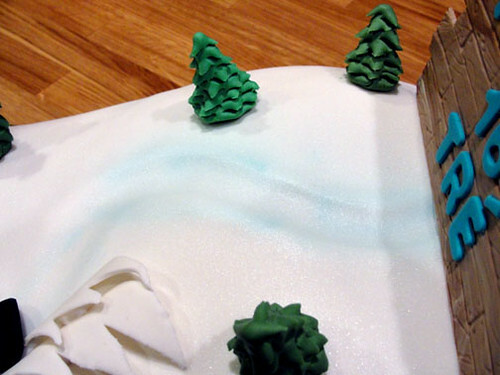 The snowy slope began as 9 x 13 layers of vanilla cake and vanilla buttercream. They were torted and stacked to the right height just so I could slowly carve at it. With a serrated knife, I slowly cut away thin pieces until I got a smooth shape and transition. My son loves this part because he gets to eat the unwanted scrapes. After removing crumbs from the cake with a soft pastry brush, I laid on a thin layer of buttercream. I also used it to smooth out sharp corners. 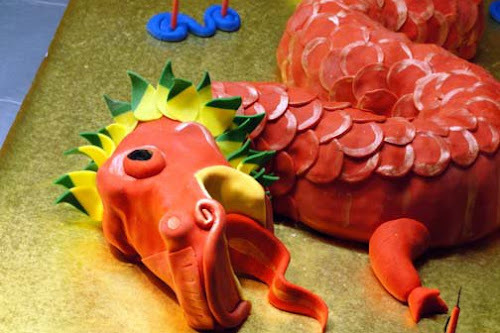 The entire cake was then covered in a smooth white fondant. The color alone wasn't enough to represent snow. We all know that when it's viewed in certain lights, it shimmers. This is where my new toy comes in... airbrushing! Using edible airbrush color, I covered the entire cake with a pearl sheen, then went back in and add a blue sheen for shadows and to bring out some details. The slope was then completed with gumpaste pine trees, and a big message board for the birthday boy. 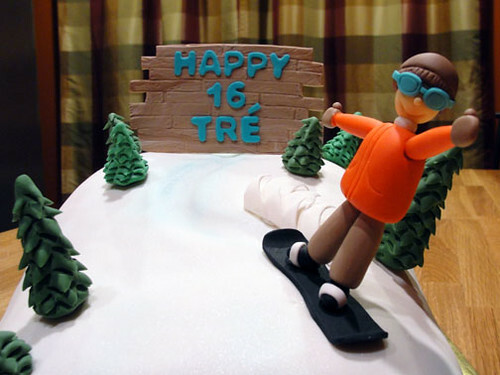 Tré was then attached to the cake, followed by a wave of snow drift for a motion effect. 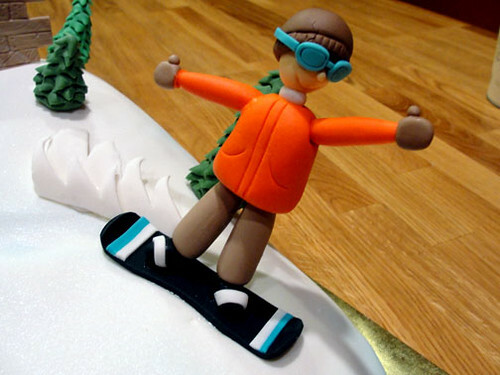 What snowboarder wouldn't love this cake! Happy 16!